Why Are Diploma Frames Expensive? As soon as you receive your diploma, your first thought should be in how you plan on framing it. While cheap diploma frames will look good for a short period of time, they won't protect your diploma or surround it with the class and sophistication it deserves. Professional framing not only protects your diploma for a long time but also gives it an added sense of flair and style. Protection and style come at a price however, as these professional diploma frames may cost more. Now you may be thinking, “why are these diploma frames expensive?”. Diploma framing cost varies depending on the framing options and materials you chose for your frame. Your diploma isn't just a piece of parchment paper. It's the result of years of study and the thousands of dollars you invested in yourself. When you add up the number of hours you spent on studying combined with the amount of money you spent on your education, your diploma becomes a very valuable document. Your diploma is a priceless document that is extremely hard to replace. A professional frame will keep it safe and secure for many years to come. A professionally crafted diploma frame will protect it from dangerous UV rays that can cause the parchment to fade or become discolored. It will also protect the delicate parchment from moisture and changes in humidity that can damage the paper. Related Post : What Is the Best Glass for Framing Your Diploma? Cheap diploma frames won't give you a professional look or the protection you want for your diploma. Diplomas that are placed in customized frames always look professional and can be placed in your office or home. Your diploma signifies your advancement from a student to a professional, and any frame that you use to protect it should convey that same message. Having it professionally framed is the only way to go if you want to keep your document safe and showcase it in the light it deserves. Cheap diploma frames are a dime a dozen and are made on an assembly line. Your diploma deserves a customized frame that is handcrafted and designed to protect it from various types of damage. 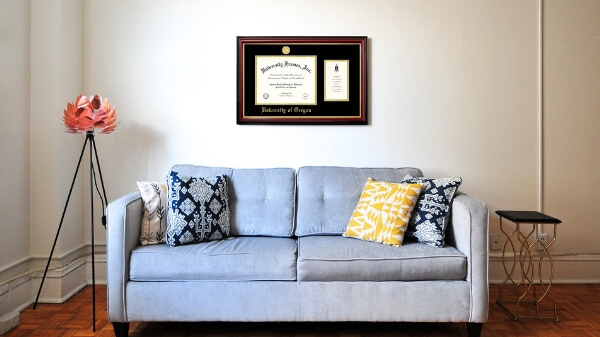 Buying a customized frame shows that you are proud of the time you spent earning your diploma. Most people choose to have a matte added to their frame for a layered, more sophisticated look. Using a professional matte and frame will make your diploma suitable for hanging in your office or anywhere you want to display your accomplishments. At University Frames, we offer the finest custom diploma frames to help you showcase, protect, and preserve your achievements. Each frame is hand-crafted to offer the highest quality and precision. We use conservation quality materials to preserve your diploma for a lifetime. What are you waiting for? Get your custom diploma frame today!